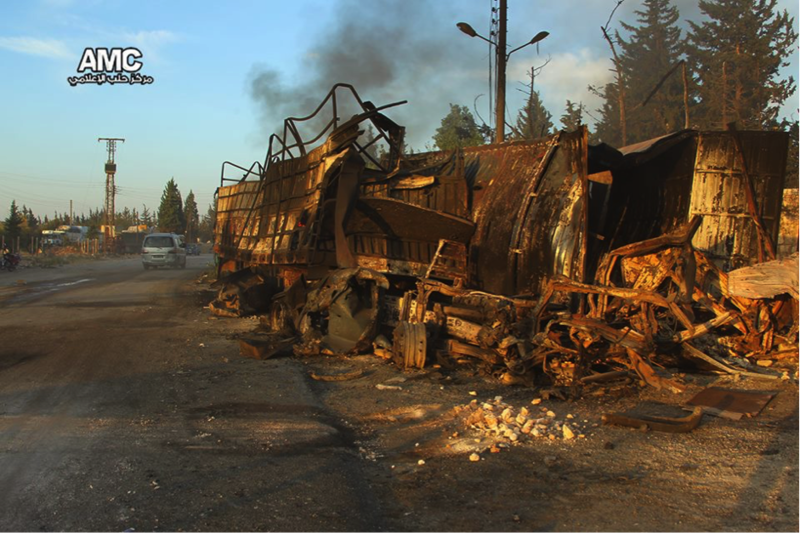 On the night of 19 September 2016, the war in Syria produced yet another atrocity, when a UN aid convoy was destroyed as it was being unloaded near the rebel held town of Urem al-Kubrah to the west of Aleppo city. The convoy had begun its journey in regime-controlled west Aleppo, and had been given clearance by both the regime and rebels to proceed. Up to 20 people were reportedly killed in the incident, including 8 Syrian Arab Red Crescent (SARC) staff. The US Administration reported that the convoy was subjected to a sustained assault that lasted for at least two hours. The incident sparked a frenetic and protracted information battle over who was responsible for the attack. The claims and counter-claims of this particular information battle were typical of the accusations that have surrounded many contentious incidents that have taken place during the war in Syria. However, the accusations concerning this particular incident have played out over a longer period of time than most, and also highlight just how difficult it is to separate fact from fiction from the information that is typically available from sources on the ground in Syria and social media. Rebel and pro-rebel sources quickly claimed that the convoy had been destroyed in airstrikes conducted by the Syrian Arab Airforce (SyAAF), the Russian Airforce (RuAF), or both. There were however, a number of significant discrepancies in the reporting of the type of aircraft and weapons that were allegedly responsible. 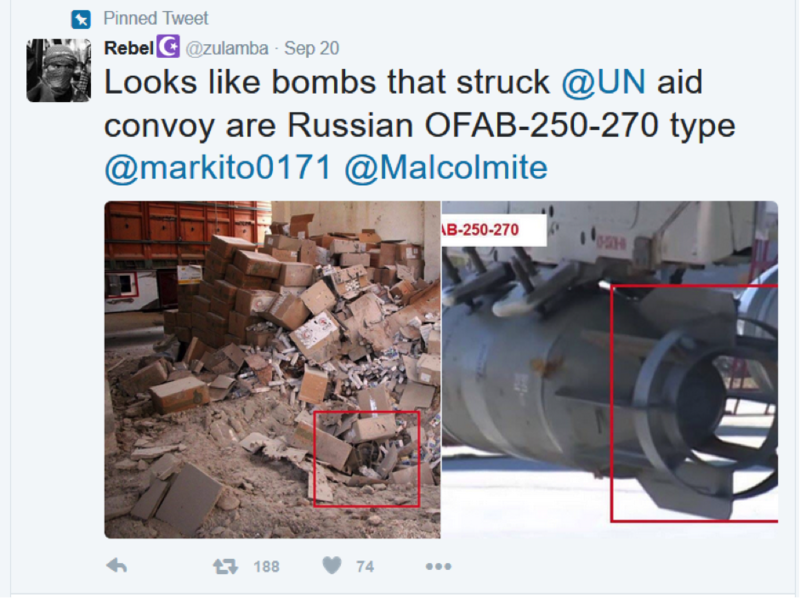 To support the contention that the RuAF was responsible, images of what was claimed to be the tail fin of a Russian OFAB-250-270 Fragmentation High Explosive bomb, lying in a shallow crater inside a warehouse at the scene, were widely circulated on Twitter. Another, wide angle image of the same scene, seems to suggest that the bomb penetrated the ceiling of the warehouse. The following image is alleged to be the same location, and is claimed to show the crater in the road after it has been filled in. [ix] Readers must determine for themselves what they believe they can see in this image. Russia and other pro-regime sources were quick to develop a counter-narrative which identified a number of potential alternative scenarios for the incident, such as an accidental fire, a rebel attack, and even a US attack, and attempted to discredit key aspects of the rebel pro-rebel narrative. It did not attempt to make a definitive claim about what happened, but instead focused on trying to establish reasonable doubts over the claims that the SyAAF and/or RuAF were responsible. The Russian media outlet Sputnik News, citing the Russian Ministry of Defence (RuMoD), claimed that the RuAF was nowhere near the convoy at the time of the incident. It declared that its analysis of the available images showed no evidence of any ammunition striking the convoy, no shell craters, car bodies were not damaged and there were no ‘construction faults’ from the burst wave. [x] Instead, the RuMoD suggested that the convoy had simply burned. This was seemingly supported by some images of burnt out trucks which showed no signs of blast damage. The RuMoD also claimed that a US drone had been operating in the area at the time, and released aerial footage showing that RuAF aircraft had been monitoring the convoy earlier in the day. 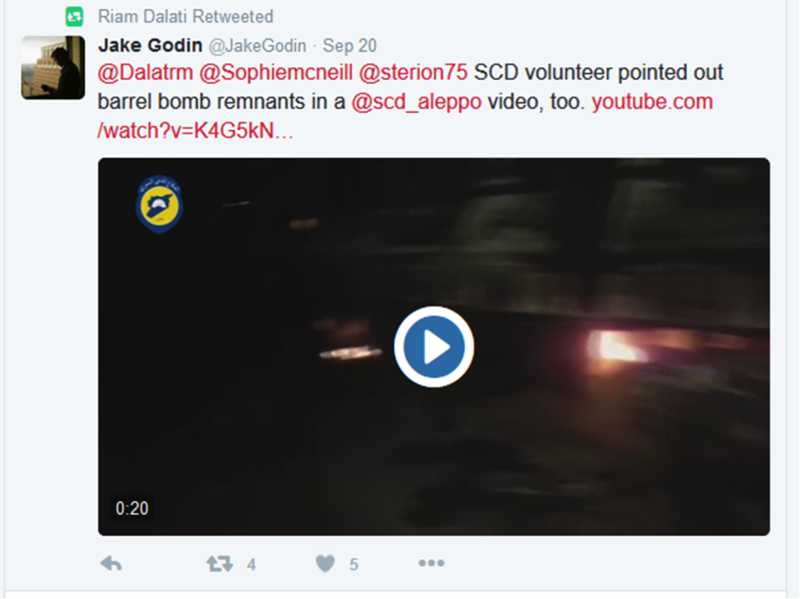 This footage recorded rebel forces alongside the convoy. 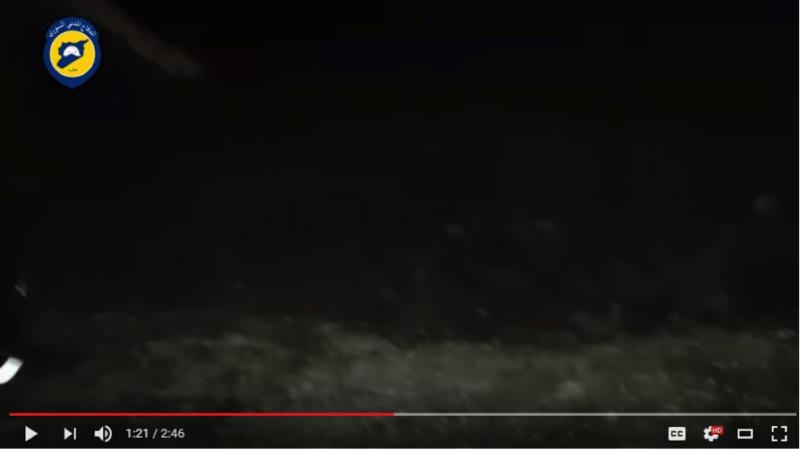 The following image from that footage purports to show a rebel pick-up truck with a heavy mortar driving past the stationary convoy. 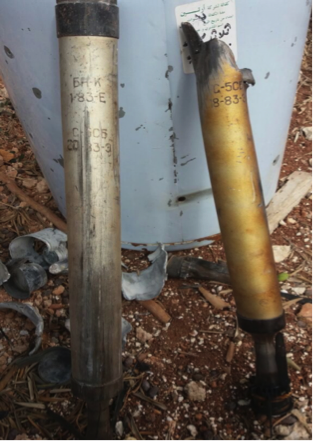 It was widely alleged that the various bomb and rocket fragments that were reportedly recovered from the two craters at the scene had been planted by the rebels. It was suggested that bomb fragments from any explosion would have been spread far and wide rather than remaining in the craters. Some pro-regime sources suggested that the incident was the result of a rebel mortar attack. [xi] Another source, shown here, showed the same image of the burnt out truck as pro-rebel sources, but claimed that it was riddled with bullet holes, implying that rebel troops had set it alight with gunfire. To date, the discrepancy between the Facebook report of the White Helmets and the official position of the US Administration over who was responsible, has not been adequately resolved. The briefing by unnamed US officials to Washington Post journalists published some 5 days after the incident looks suspiciously like a belated attempt by individuals within the US Administration to bring the US positon into line with the report of the White Helmets. There has also been considerable debate over the images of the OFAB-250-270 tail fin located inside the warehouse. 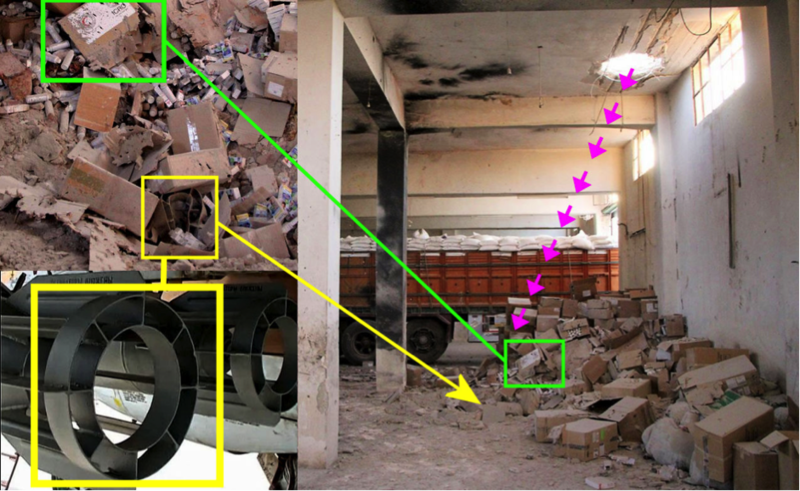 Pro-regime sources argue that an OFAB-250-270 could not have detonated inside the warehouse given that there is no blast damage to the walls, the window frames are still intact, and boxes of aid are stacked virtually on top of it. [xiv] So where is the rest of the bomb? Pro-rebel sources countered by suggesting that the bomb had exploded on the roof and just the tail fin penetrated into the warehouse. Others suggested that the bomb did not detonate at all, and the rest of it lies buried in the crater. Further examination of the site is clearly required in order to shed further light on the matter, but that has not happened. Some of the RuMoD claims can be easily refuted. In particular, the video footage of the incident clearly shows a number of explosions, which indicates that the suggestion that the convoy simply caught fire are not credible. 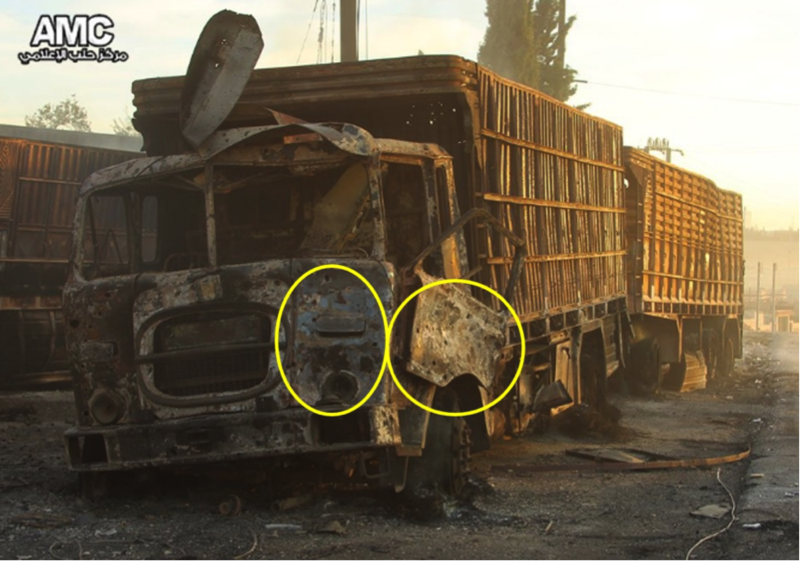 Similarly, there are a number of images of cars and trucks at the site showing shrapnel/fragmentation damage, which directly disproves Russian claims to the contrary. Yet pro-rebel sources have failed to produce convincing evidence of bomb craters consistent with a sustained attack by multiple barrel bombs and OFAB-250-270 bombs. 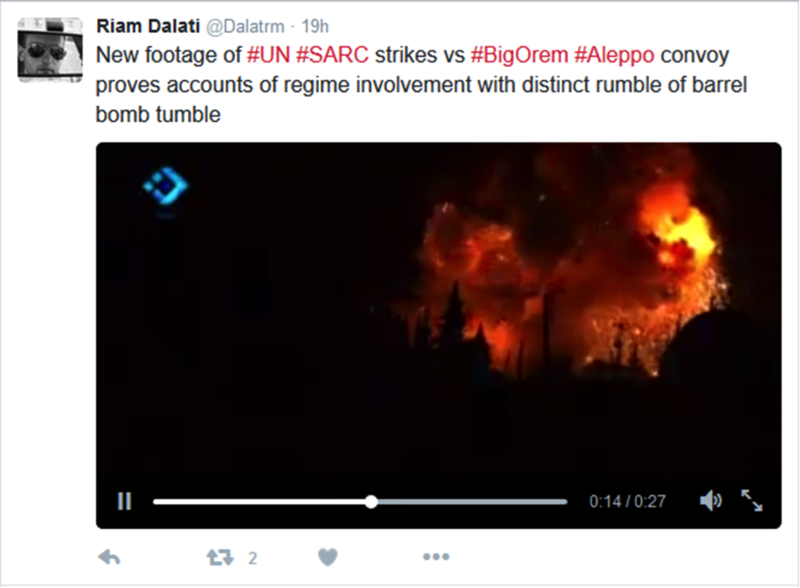 To support their case, pro-regime commentators have questioned why either the SyAAF or RuAF would attack the convoy. There was no need for either to attack the convoy, because the Syrian regime could simply have refused the convoy permission to travel from the regime controlled part of Aleppo city to Urem al-Kubrah if it so wished. Both the regime and Russian government would also have been acutely aware of the likely political reaction from attacking the convoy. If either was indeed responsible, it suggests that they were totally unconcerned about the likely international political reaction. But the very fact that the Russian government has gone to significant efforts since the incident to deny responsibility, indicates that it is sensitive to the political reaction. There was also considerable speculation on social media over the timing of the incident. Clues to the potential culprit of some incidents can sometimes be gleaned from the timing of an incident, but that is not the case with this incident. There were a number of significant events occurred shortly before the incident, which were argued to have been causal factors for the attack. The most significant event occurred earlier that same day, when the regime announced the end of a week-long ceasefire. Pro-regime sources also claimed that the attack coincided with a renewed rebel offensive operation around Aleppo. Pro-regime sources also point out that it occurred two days after a Coalition airstrike killed 60 regime troops at Deir-e-Zor, which cast the regime as victim rather than aggressor. The other noteworthy event were the discussions on Syria that took place in the UN Security Council on 21 September. Pro-regime sources argued that the rebels staged the attack in order to re-establish the narrative of the regime/Russia as the aggressors in the lead up to the UN meeting. In contrast, the end of the ceasefire enabled pro-rebel sources to claim that the attack was simply part of a pre-existing pattern of SyAAF and RuAF attacks on civilian targets. The much lauded White Helmets who have provided the primary evidence of the incident, are not an impartial source. 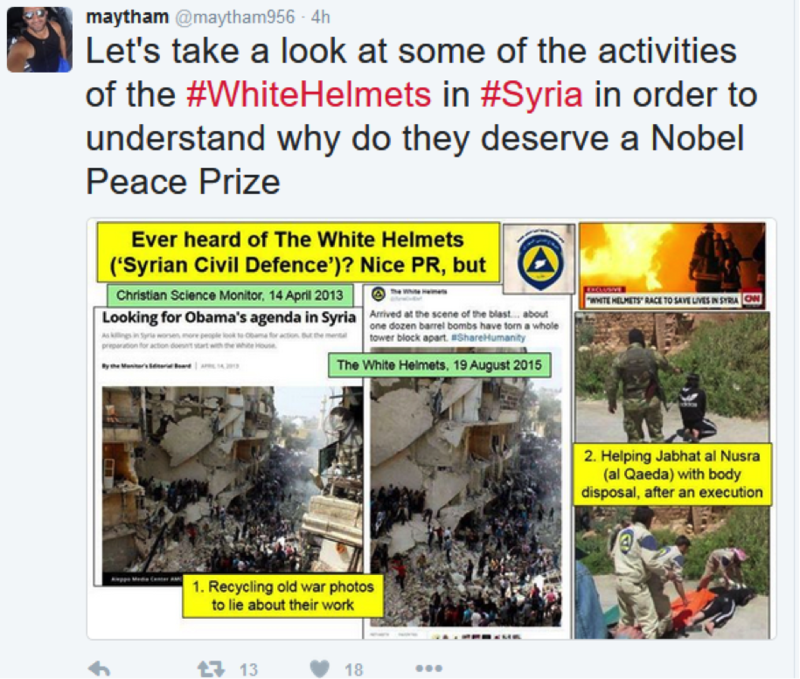 They are an institution of the Syrian revolution, and pro-regime sources have used social media to highlight previous instances of where the white Helmets have fabricated evidence and co-operated with armed groups (see following tweet). This does not necessarily mean that the White Helmets have fabricated evidence in respect of this incident, but it does indicate the need to critically examine whatever information they have provided. The video and still images of the incident itself and the scene afterwards, are very difficult to interpret by non-specialists. Even the specialists at Unosat report that the evidence is not conclusive. It is unclear who among the many social media sources who are analysing the video and still images may be either professionals or experts in what they are talking about. The vast majority of social media sources who comment on the war in Syria are not disinterested observers, they are either pro-rebel or pro-regime. As a result, their observations on this incident are probably subject to confirmation bias, i.e. they interpret events/evidence in a way that is consistent with their pre-existing belief system. This potential for confirmation bias to affect a source’s analysis is exacerbated by the fact that the evidence in this instance is not conclusive. These factors mean that many of the sources of information related to this incident are of uncertain credibility, and need to be examined critically. But what is clear is that neither side in this particular information battle has a wholly consistent narrative. The pro-rebel narrative is the most coherent of the two, but inconsistencies between the accounts of the White Helmets and the US Administration, together with the question marks over key aspects of the physical evidence allegedly recovered from the scene give rise to doubts about its credibility. In contrast, the pro-regime/Russian counter-narrative has no cohesion whatsoever, consisting largely of a scattergun approach to discredit as many aspects of the pro-rebel narrative as possible, without actually establishing a coherent case for what did actually happen. This counter-narrative has been successful in casting reasonable doubt on key aspects of the pro-rebel narrative, but to believe this counter-narrative, one has to believe that the rebels themselves destroyed the convoy and planted the evidence. 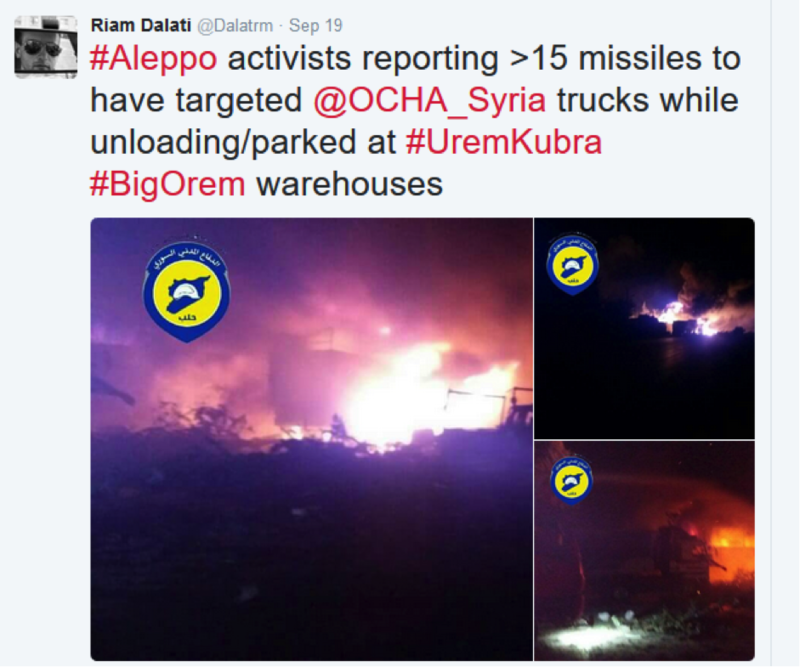 There are certainly instances where the rebels have fabricated evidence for propaganda purposes (see my blog Youtube Propaganda of Rebel Tank Hunting in Syria, 6 December 2015), but destroying a UN aid convoy and framing the regime/Russia, would be of a completely different order of magnitude to their previous fabrications. However, the rebels have two key advantages in this information battle. Firstly, in the wider information war that is taking place over Syria, regime and pro-regime sources are routinely disbelieved in the west because they are considered to be simply disseminating propaganda and covering up atrocities. As a result, pro-rebel propaganda and narratives are routinely given more credence by western media and governments than pro-regime propaganda and narratives. Secondly, the incident fits with the accepted pattern of the SyAAF and RuAF routinely and indiscriminately attacking hospitals and other civilian targets. Consequently, the rebel narrative on the UN aid convoy incident was quickly accepted by western media and governments. Yet as with many other incidents that have taken place in Syria, it is impossible to be absolutely certain about what happened. It is perhaps for this reason that the UN itself referred only to unspecified “attacks” on the convoy. [xvii] In the end, governments, media outlets, and individual people themselves, will believe what they want to believe about events in Syria, based on their pre-existing attitudes towards the conflict. For the time being at least, the rebels are winning the wider information war, and as a result, pro-rebel accounts of incidents such as this find much wider acceptance than pro-regime narratives in the western media and political debates. [i] Syria Civil Defence Facebook page, https://www.facebook.com/Civil1Defense1in1Aleppo/videos/1114608368618820/. 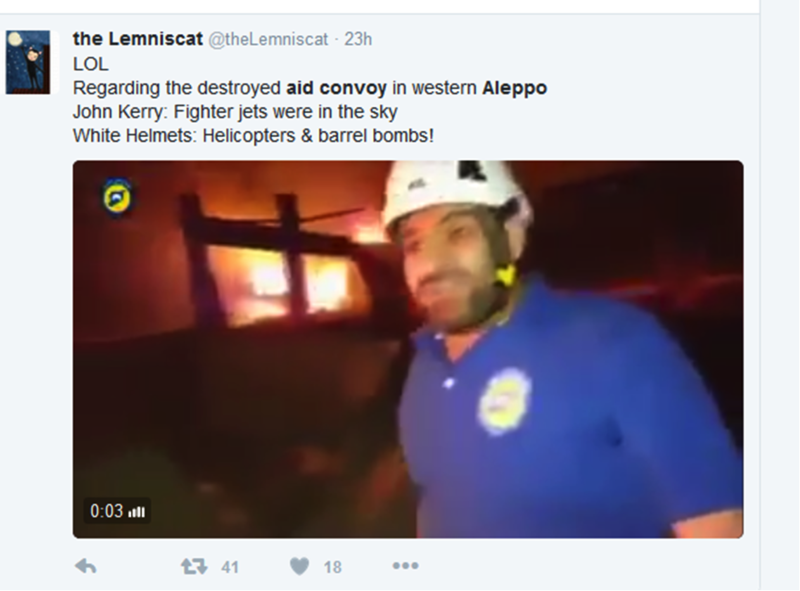 [ii] Nick Waters, Analysis Of Syrian Red Crescent Aid Convoy Attack, Bellingcat, 21 September 2016, https://www.bellingcat.com/news/mena/2016/09/21/aleppo-un-aid-analysis/. [iii] US Officials Say Russia Probably Attacked UN Humanitarian Convoy, New York Times, 20 September 2016. [iv] Syria Conflict: Aid Convoy Attack Was Air Strike, UN Expert Says, BBC Newsonline, 5 October 2016, http://www.bbc.co.uk/news/world-middle-east-37561755. 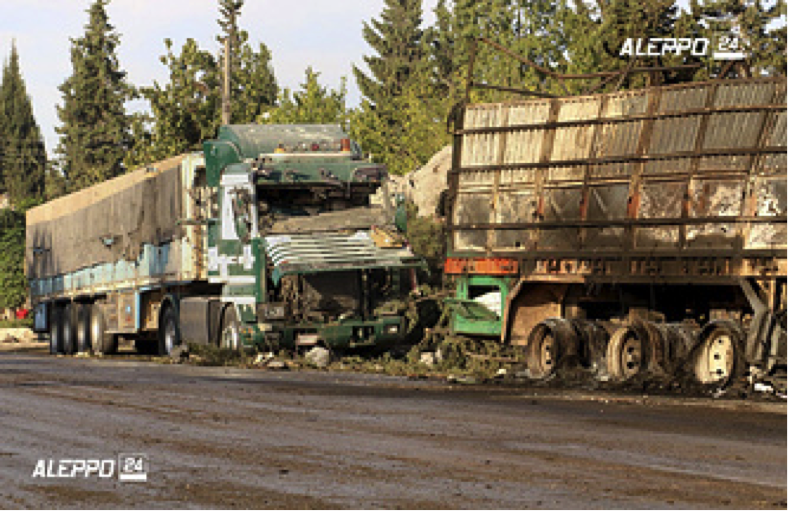 [v] ‘Why Did They Wait To Kill Us?’: How The Attack On The Aid Convoy Near Aleppo Unfolded, Washington Post, 24 September 2016, https://www.washingtonpost.com/news/checkpoint/wp/2016/09/24/why-did-they-wait-to-kill-us-how-the-attack-on-the-aid-convoy-in-aleppo-unfolded/. [vi] Syria Aid Convoy Attack: ‘The Bombardment Was Continuous’, The Guardian, 21 September 2016, https://www.theguardian.com/world/2016/sep/20/the-bombardment-was-continuous-the-rescue-teams-werent-even-able-to-work. [vii] ‘Why Did They Wait To Kill Us?’: How The Attack On The Aid Convoy Near Aleppo Unfolded, Washington Post, 24 September 2016, https://www.washingtonpost.com/news/checkpoint/wp/2016/09/24/why-did-they-wait-to-kill-us-how-the-attack-on-the-aid-convoy-in-aleppo-unfolded/. [viii] Nick Waters, Analysis of Syrian Red Crescent Aid Convoy Attack, Bellingcat, 21 September 2016, https://www.bellingcat.com/news/mena/2016/09/21/aleppo-un-aid-analysis/. 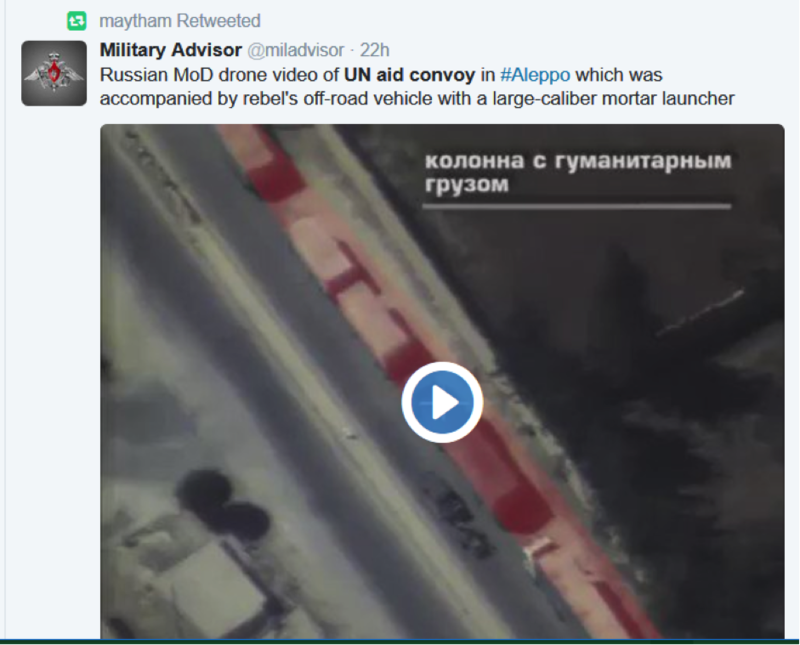 [ix] Nick Waters, Analysis of Syrian Red Crescent Aid Convoy Attack, Bellingcat, 21 September 2016, https://www.bellingcat.com/news/mena/2016/09/21/aleppo-un-aid-analysis/. [x] Twitter, @Sputnikint, 20 September 2016. [xi] Twitter, @theLemniscat, 20 September 2016. 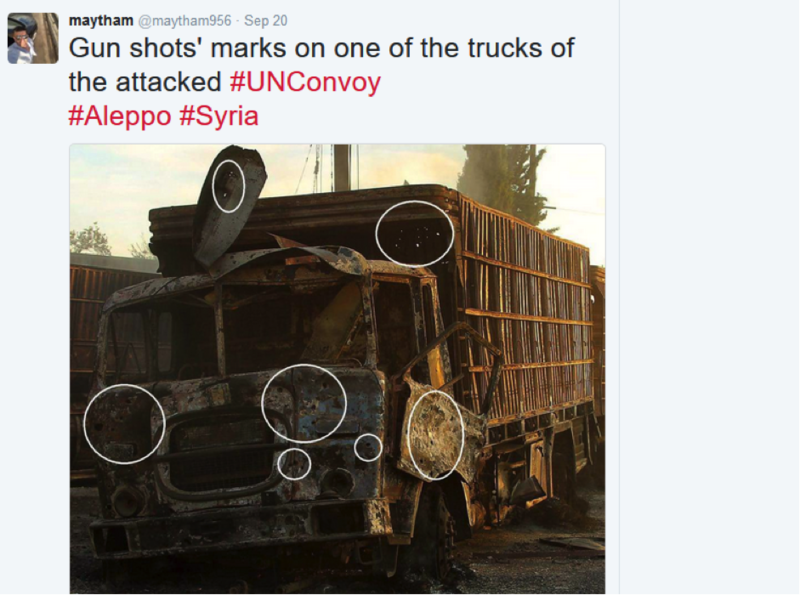 [xii] Nick Waters, Analysis of Syrian Red Crescent Aid Convoy Attack, Bellingcat, 21 September 2016, https://www.bellingcat.com/news/mena/2016/09/21/aleppo-un-aid-analysis/. [xiv] A Look Closer On Syria, File:OFAB-250 bomb in Urm al-Kubra warehouse.jpg, 202020, http://acloserlookonsyria.shoutwiki.com/wiki/File:OFAB-250_bomb_in_Urm_al-Kubra_warehouse.jpg#Discussion. [xv] Syria Conflict: Aid Convoy Attack Was Air Strike, UN Expert Says, BBC Newsonline, 5 October 2016, http://www.bbc.co.uk/news/world-middle-east-37561755. 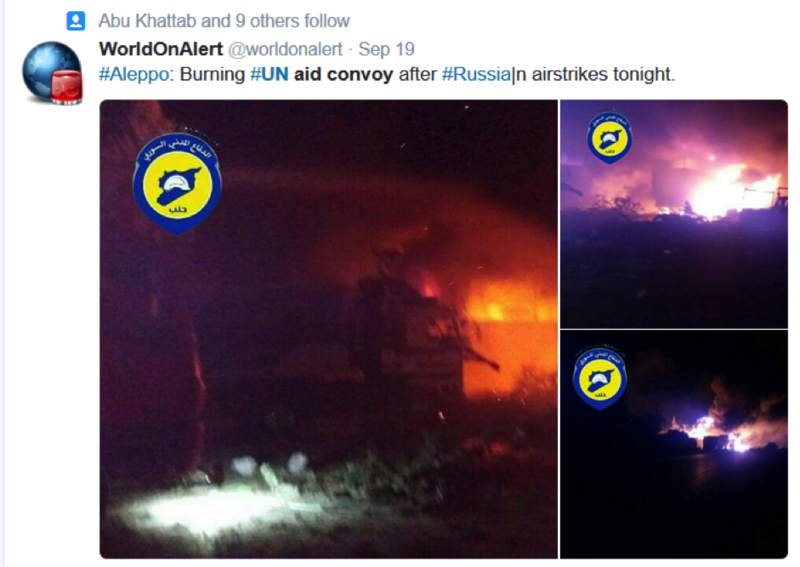 [xvi] September Attack On UN Aid Convoy In Syria Well-Prepared Hoax, Investigators Say, Sputnik News, 5 October 2016, https://sputniknews.com/middleeast/20161005/1046020958/un-convoy-attack-hoax.html.